For other people named Henry Porter, see Henry Porter (disambiguation). 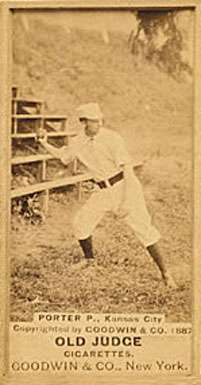 Walter Henry Porter (June 1858 – December 30, 1906) was an American Major League Baseball player born in Vergennes, Vermont who pitched for three teams during his six-year career. Porter began his career in the short-lived Union Association for the replacement team Milwaukee Brewers. It was for this team that he struck out 18 batters in one game on October 3, 1884. The 18 strikeouts in one game by a losing pitcher stood as the record until Steve Carlton surpassed it when he struck out 19 in one game in 1969. When the Association folded following the season, he was picked up by the Brooklyn Grays, with whom he was their star pitcher. In 1885, he had a record of 33 wins and 21 losses, followed up the next year with 27 wins and 19 losses. After having a 15–24 record in 1887, Porter was purchased by the Kansas City Cowboys for 1888. He had a record of 18–37, leading the league in hits allowed, runs allowed, home runs allowed, and losses, but on June 6, he pitched a no-hitter against the Baltimore Orioles. Porter died in Brockton, Massachusetts at the age of 48, and is interred at Calvary Cemetery, also in Brockton.